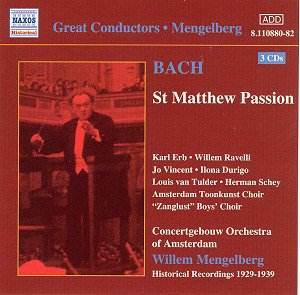 The good news for Mengelbergians is that, unlike Philips� 2 CD release of some years ago, this Naxos St Matthew Passion is complete as recorded and originally issued. For the Psalm Sunday performance in the Concertgebouw given in April 1939 the conductor made some habitual cuts and for the record these were nos. 23, 29, 38, 41, 48, 50-3, 55, 61, 65-66, 70 and 75; he abridged a further number of the recitatives and arias, even the Chorale O Haupt voll Blut und Wunden (No.63) but the performance here is intact as it was when issued after the War. The copies were transferred from LPs because the recording was preserved on celluloid film, which has ensured a creditable fidelity and in particular captures the Concertgebouw acoustic in all its glory. The idiosyncrasies, outsize romanticised gestures, huge rallentandi and other Mengelbergian aesthetic traits apply to Bach as much as to anyone he conducted. The cantilevered string choirs, emphatic choral entry points, the pronounced and slow tempi and shuddering caesurae are part of his expressive armoury and they remain problematically nourishing. We can also hear from the start the very distinctive contribution of the well-drilled "Zanglust" Boys� Choir � their entries marked by a sudden onrush of boyish animation. Of the soloists Karl Erb was then 62, an Evangelist of great experience and authority, whose presence adds dignity and drama to the performance though his voice is inclined to be monochromatic and lacking in the full range of colours. Some strain at the top of his tessitura is unavoidable I suppose but otherwise his is a noble assumption, one that often reaches profound heights. Alto Ilona Durigo was slightly younger than Erb � about 57 � and a Hungarian notable for her Mahler and Schoeck but not for any operatic career (just one performance in point of fact). She sounds rather matronly here with an occasionally obtrusive vibrato, but she�s stylistically apt in the context of Mengelberg�s vision of things. As Jesus the Dutch bass Willem Ravelli can be a mite gruff but he�s also a spiritually intense presence and right inside the role, one incidentally he performed over four hundred times. Jo Vincent is the youngest of the soloists but even so she was then already forty-one; her aria with the orchestral flautist in Aus Liebe will mein Heiland sterben is radiant and she sings throughout with great purity and control. Tulder and Schey acquit themselves well. There is a full range of obbligato instrumentalists; agile flautist Hubert Barwahser and the feminine-sounding fiddle of orchestral leader Louis Zimmermann, the rather harp-sounding harpsichord in No.62 (most idiosyncratic) and the dramatic organ flourishes in No.33. And then there are the chorales, whether dramatic or intensely withdrawn, no matter that a couple may have been slightly cut and you have a performance of massive spiritual identification in the romantic tradition. Coupled with it is the rest of Mengelberg�s commercial Bach legacy. The Suite No.2 is well known; Archipel�s transfer is booming and poor but Michael G Thomas�s is much better and this is on a par with that one (now unavailable in any case). The two Airs make entertaining discmates in the two arrangements, one by Mahler, the other by Telico, which is harp-laden and slower than the New York-Mahler version of nine years previously. The Double Concerto is getting increasing release these days; this one has been transferred from a tape copy and is therefore not ideal though it�s quite acceptable. It�s rather better than Pearl�s disappointing one. Zimmermann and Helman were two of the orchestra�s concertmasters and make a glamorously romanticised pairing, even if the more elfin Zimmermann is not over-assertive. The three CD set comes with cogent notes - no texts of course, but plenty of vitally imaginative music-making of the old school.